Welcome to the 237th (07/16/2015) week of Travel Photo Thursday. 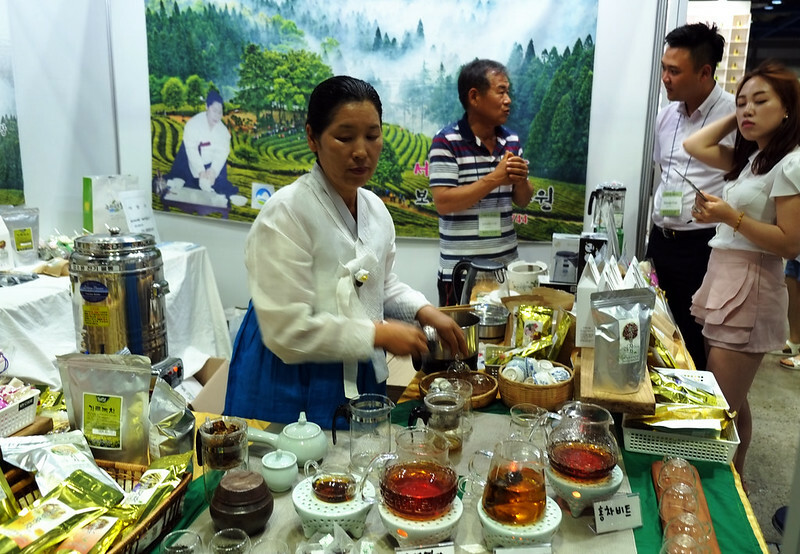 As the rain beat down and the wind whipped our umbrellas into a frenzy I was glad to be heading to Korea’s Tea World Festival in Seoul last weekend. Seoul’s prime exhibition center, Coex, is easily accessible by subway, so we didn’t worry about getting wet as we ventured from the train station to the subway platform. I’ve been to quite a view events at Coex, over the years, and normally things at the venue are beyond frantic with throngs of people coming and going. Last Saturday was different. There were many people weaving in and out, but it was not nearly the busyness that I remember at past events. MERS was definitely the culprit. The virus has stopped many people from venturing into crowded spaces, unless absolutely necessary. The show area was busy, but not too packed. Not only did MERS keep the public at bay, but vendors as well. I had expected to sample tea from all over SEA, China, and Japan, but (happily) settled for Korean only tea. Enjoy the photos. I can’t think of a better way to spend a dreary afternoon than sipping tea from pretty cups! Please remember to leave your link and comment at the end of this post! If you knew which vendor you wanted to visit, you could find them here. 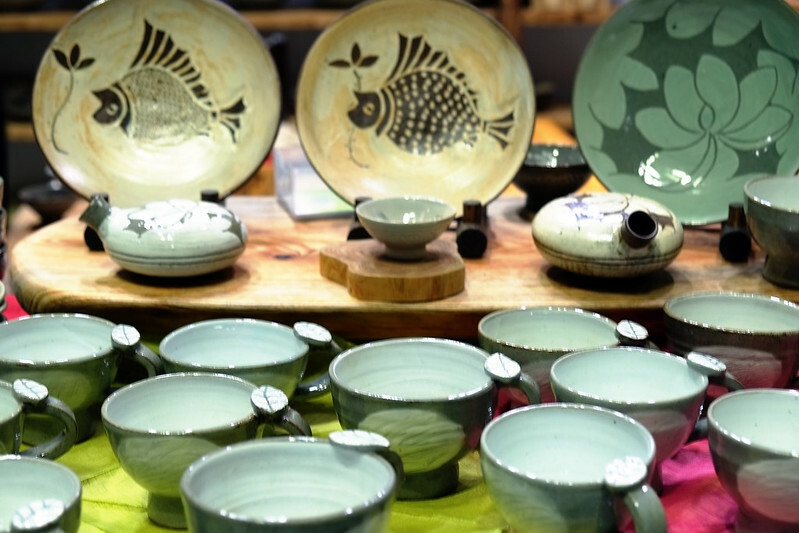 All of the vendors were busy pouring into dainty tea cups. English among many of the vendors was minimal, so we weren’t always quite sure what kind of tea we were drinking. 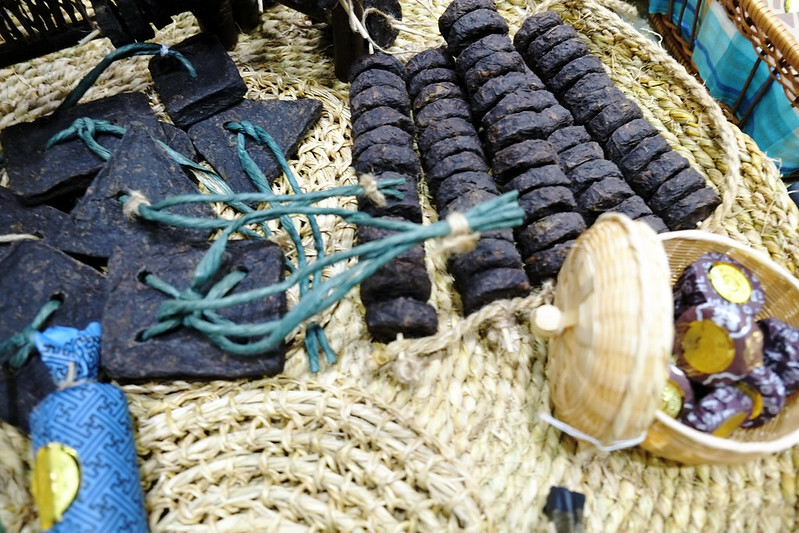 Tea leaves are packaged in a variety of shapes and sizes. Keeping the tea piping hot for the next customer. 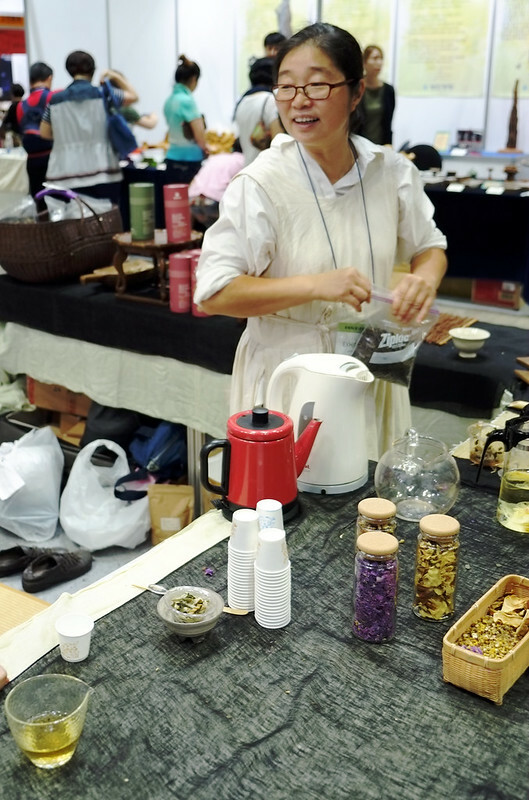 Most booths had several different teas available for sampling. 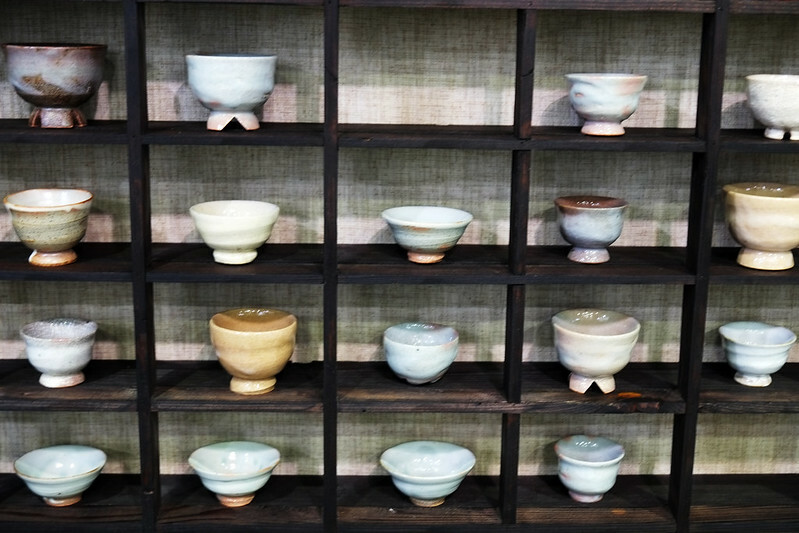 Korea is famous for its celedon pottery, and quite often these pieces are used for tea making or drinking. I could have bought one of each! 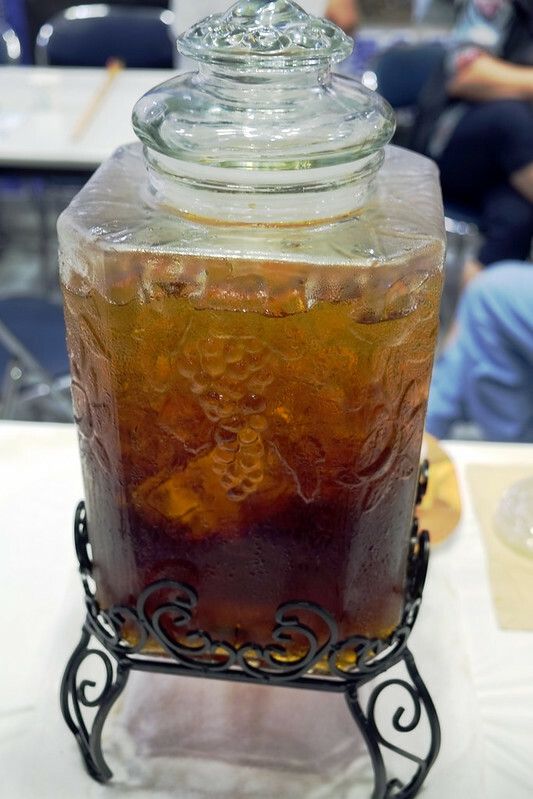 This iced lemon tea made from dried lemons was delicious and refreshing. The soothing tea pouring ritual. 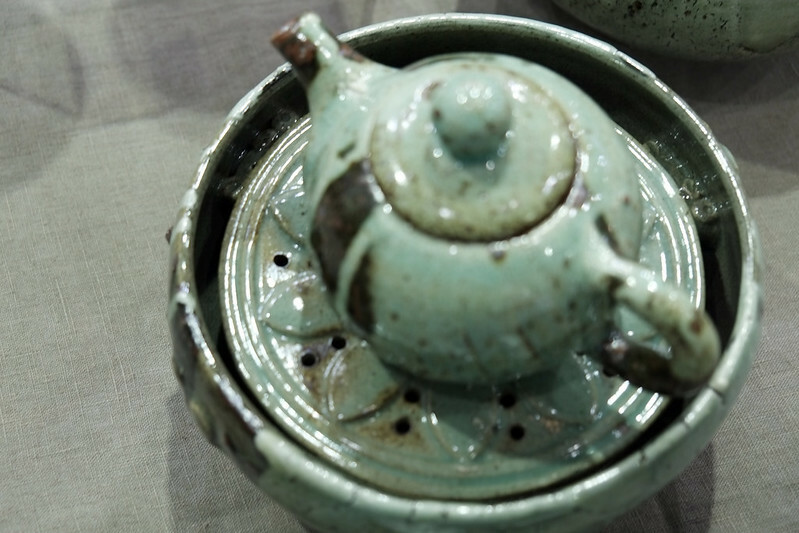 Tea pots and tea making paraphernalia come in many different shapes and sizes. 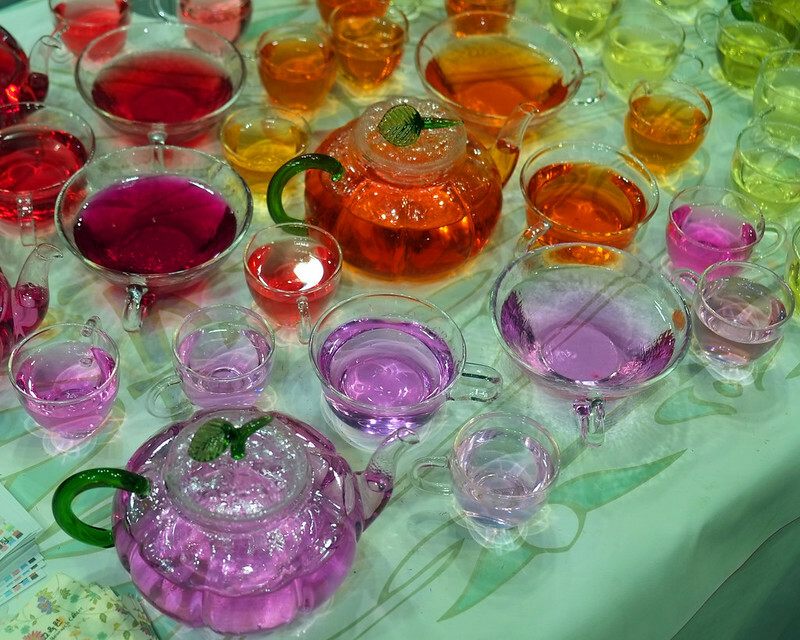 We really wanted to sample these colored teas. Aren’t they pretty? For some reason no samples were available when we went by. 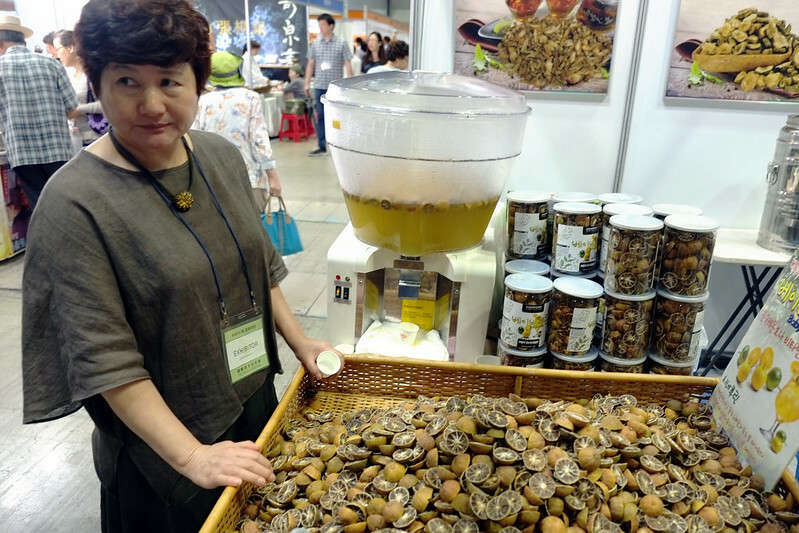 Koreans ferment just about everything, so why not tea? I think it’s an acquired taste. There were a variety of teas made from flowers on offer. The language barrier made it a little difficult to understand what was what. One of these was definitely chrysanthemum, which is one of my favorites. However, I can buy a large bag in Thailand for a couple of dollars. Here in Korea a small package can set a person back between $20 and $30! Ouch!! These two ladies were lovely. They tried so hard to communicate with us with their gestures, and they succeeded. The box she is holding “Good Tea Full Selection” contains 14 numbered samples. Each sample is a different kind of tea, each with it own medicinal properties. How do I know that? Well, these resourceful entrepreneurs had a book printed in English, containing descriptions of each of the 14 teas! Of course, I bought a box, and I can’t wait to try each one. This is one of my first tasty projects after moving into new apartment. Stay tuned! Hanging out with the tea bags at the Tea World Festival. It wasn’t all about tea. There were quite a few vendors selling loving clothing pieces made from traditionally woven cloth (like remie and hemp). 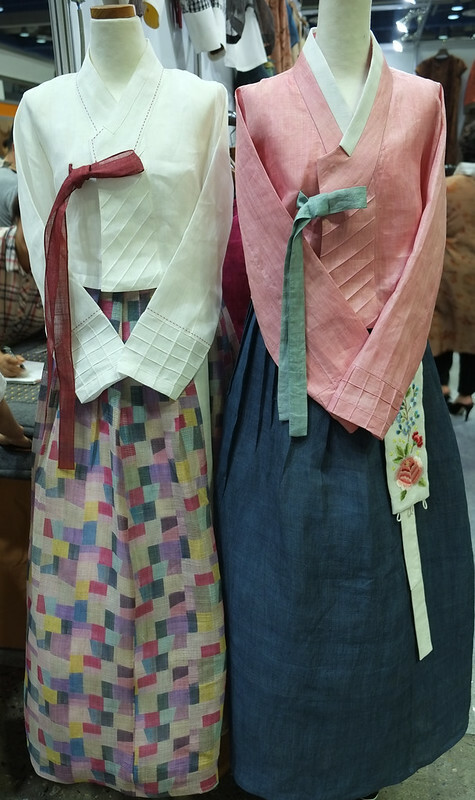 I thing these traditional hanbok are so lovely. The material, colors, and patterns are very Korean. 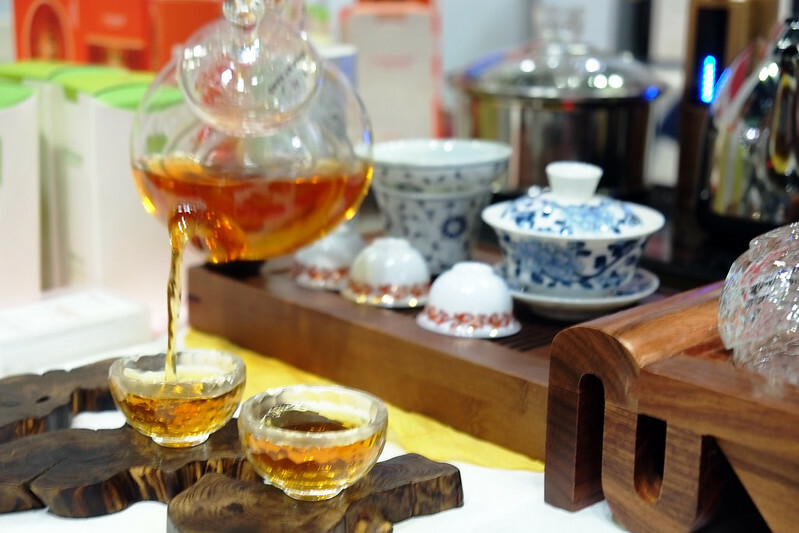 If you like tea, I highly recommend a visit to a tea festival. You’ll get to sample and enjoy a variety of unique teas, and may walk away with a new favorite. Of course there’s also the beautiful tea cups and other tea paraphernalia to ogle (and if you’re like me, to lust after)! There is always something going on at Coex, so if you’re visiting Seoul check out their exhibition schedule. 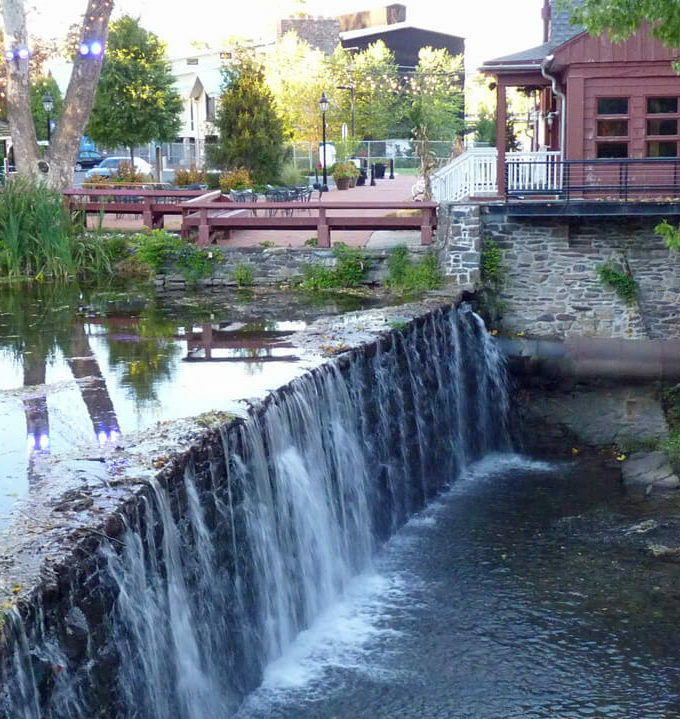 The public is always welcome, and the price of admission is usually only a few dollars. To reach Coex hop on subway line 2 (green line), and get off at Samseong Station. Exit 6 takes you directly to the Coex mall. Follow the signs and you’ll soon find yourself in the exhibition area. The purple tea is so pretty – that photo is fab!! 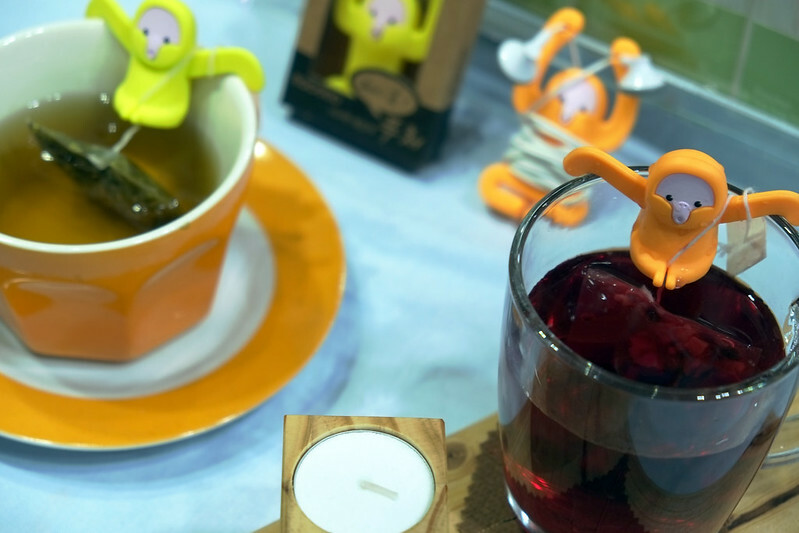 I like the little men soaking in the tea cups too! I have a scuba diver tea-strainer….very cute. I’d not realised what went on at a tea festival (I guess I hadn’t thought about it). Such a pretty photo, the one with all the teas. Hi Lydia. I like the look of that purple tea, too. Loved the teabag holders. I think they would make a great gift for any tea lover. Hi Nancie, We’re not hearing anything about MERS here in Australia. I take it that you are not concerned about catching it? I too love the pottery pieces and would be tempted to buy several. The coloured teas do look interesting. I would definitely love to try the teas as I usually stick with a few favourites. It would be nice to add a new one without having to buy to try. I’m with you. If I’m going to try a new tea, I want the first tasting to be free. Although in SEA tea is so cheap that I don’t mind buying without tasting. Korea is another story. Tea is expensive here. Hi Lily! I loved those tea disks as well. When I was in China I saw these huge tea disks. Some of them cost thousands of dollars! I think the tea service ceremonies are lovely and the china is beautiful. I am sitting here sipping my coffee — to which I am addicted — but your post did get me to thinking how good tea might taste if I could just quit loving coffee! Hi Jackie. I was a coffee only lady for years. Then, I got turned onto tea, and I love it. I still drink coffee when I go to a coffee shop. Both tea and coffee are expensive here, and I can never bring myself to pay 5 bucks for a teabag and some hot water…haha. This festival is so cool! I can pick favorites. I like all your photos. The world of tea is so wide and varied. I went once to a tea tasting session and it was amazing. So much to learn about different type of teas and how to prepare them. Hi Ruth. I would love to know more about tea. Maybe when I retire I will become a tea expert! I really enjoy trying different teas and these look very enticing. 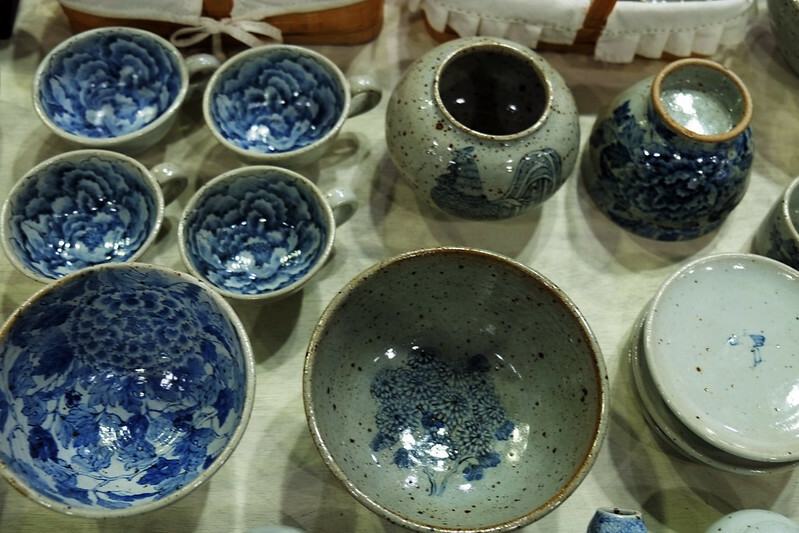 The dainty cups and pottery is beautiful. Great post! This looks like such a fun festival to attend. I’m not a big tea drinker but I love pottery. Those all look beautiful. I’m intrigued by those colored teas. Great pictures, Nancie. Hi Mary. We wanted to try the colored tea, but there seemed to be some miscommunication going on. Not sure why, but the vendor wasn’t pouring while we were at the booth, and didn’t seem like he want to offer us any! I love a good cuppa in the afternoon, especially if it’s chilly out. Are the samples included in admission and as many tastings as you like? I could spend forever wandering around in there probably. And I’d definitely end up going one with some of that beautiful pottery, probably that tea set on the tray you showed. Hi Michele. Yes, you can taste as much as you want. There were even some vendors performing the traditional tea ceremony, but very busy with loads of people waiting. It was hard for me to walk out with no pottery, but eventually I would have to think about shipping it somewhere (I hate being practical!). It’s really interesting to see how they package the tea. I like the squares of tea with rope (presumably to hang it up). Hi Ellen. I liked the packaging too. They would make a nice kitchen decoration. The idea of lemon ice tea sounds really good to me right now! Going to a tea festival sounds like great fun! Hi Rachel. The lemon tea was delicious! What a treat! I’d be in heaven here, Nancie. I’d definitely have to leave with some teas and tea making paraphernalia. Enjoy your new apartment! This looks fascinating. I’m more of a coffee guy myself, but the tea culture of Asia could maybe make be a convert. The cups and teapots alone could stop me for hours just to admire. Hi Tom. The tea pots and cups really are beautiful. I drink a lot more tea than coffee, since moving to Asia. Of course, coffee is now all the rage here. We are flooded with coffee shops. I don’t think I ever heard of a tea festival before but it looks charming! I’m surprised by how expensive it is though. I admire your ability to resist buying some of those charming tea sets – the jade one probably would have won me over! I love tea and pottery. I can understand why you had a difficult time not to go on a buying spree. When your traveling though its sometimes not practical to buy a lot of stuff to lug around. Hi Holly. You’re so right. I’m an expat, and not sure where I will finally end up. I try to keep the souvenir purchases to a minimum. Oh I love a tea ceremony! I went to several in Taiwwan when we were there. But this looks fab. The idea of dried lemon tea sounds gorgeous too, and the pottery and those dainty tea cups – hmmm, my suitcase might be full too! Hi Johanna! I’ve been to the tea ceremonies in Taiwan, too. They are lovely. Pottery and tea cups really do test the will power! I love tea and tea ceremonies and different tea flavours so this would suit me a lot. I am also an avid coffee drinker. Hi Paula. I also like both tea and coffee. When I’m home I drink mostly tea. Out and about I always drink coffee. 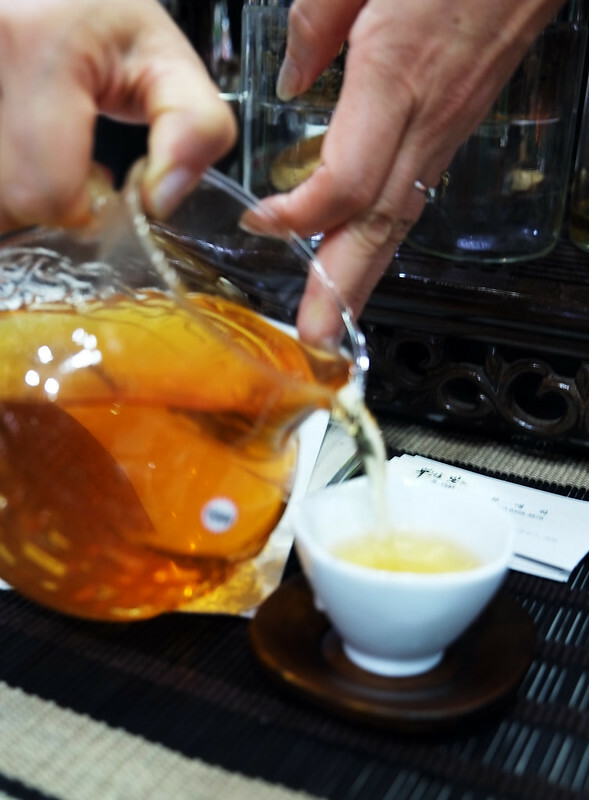 We went to a wonderful Tea House in Taiwan and we thought that was quite an experience with all the different teas, pottery, and ceremonies but a Tea Festival would be better in many more ways. 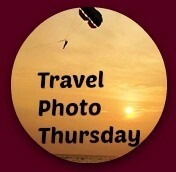 And congrats on your 237th Travel Photo Thursday!!! Hi Carol. Thanks, the link-up has been going for a while  I’ve been to tea houses in Taiwan as well, and they are lovely. It would definitely be the perfect place for you! What pretty tea colours and lovely pottery! It’s nice to have tea from a pretty cup. We have a celedon vase we picked up at a second hand market in Seoul a few years ago and it is a favourite memento of Korea. 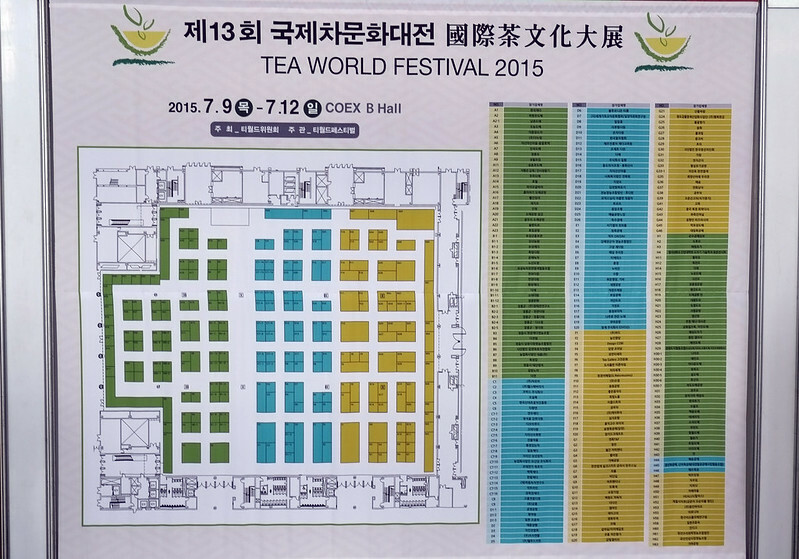 I enjoyed reading about the Tea World Festival in Seoul. Your pictures are excellent! I have a friend who would love to visit an event like this. He loves tea like I love Diet Coke!! Oh man. Mr. Excitement would have loved this place. Ever since we visited Taiwan in 1997(! ), he has been a bit of a tea snob and he stopped adding sugar. 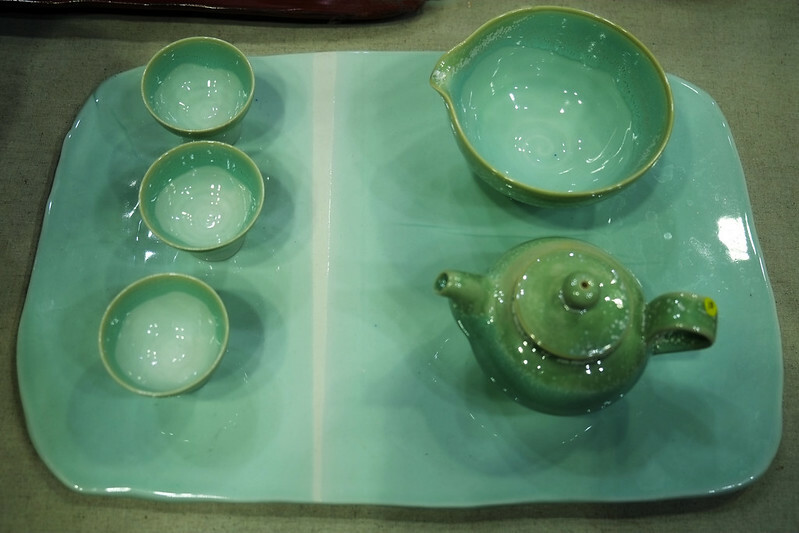 The celadon tea sets are gorgeous. I hope you treated yourself to one.